Forget sailing in cold damp Northern Europe! Learn to sail among the islands that were known to the ancients as the Isles of Eternal Spring, an acknowledgement of the excellent climate of the Canaries, which enables us in the 21st century, to enjoy perfect spring/summer sailing conditions all year round. Along the lee shores of Gran Canaria the inshore winds are normally light and the seas calm. There are a variety of anchorages and marinas to visit - ideal for beginners. If you want to gain valuable experience in berthing, boat handling and anchoring, both under sail and power. 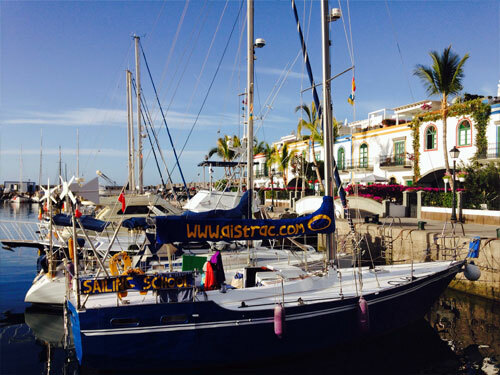 Other islands within the Canarian archipelago are approximately a sixty NM sail away from our base. The sea and wind conditions between the islands are dramatically different from those of the lee shores, winds can (and often do) increase to 25-35 knots or more with surprisingly moderate seas.